There are four classes that are mostly solved. Shaman, Warrior, Paladin, and Priest all consist mostly – over 90% – of a single archetype. Hunter is close behind, whereas Mage, Druid, Warlock, and Rogue exhibit more diversity. Shaman is Shudderwock. Every team that had a non-Shudderwock Shaman on week one switched over to the power of claws and jaws with only Poland going against the grain and moving over from Shudderwock Shaman to Even Shaman. Shudderwock Shaman was also the most banned archetype at 23 – 9 times in the first phase. If it was not banned immediately, it was picked in the first pick phase the most, 16 times. Warrior is Taunt. Even France gave up on Fatigue Warrior and moved back to the welcoming warmth of Fire Plume’s Heart. Only China resists and still brought Odd Control Warrior, all 47 others were Taunt Warriors. However, unlike Shaman, Warrior is not considered a powerhouse. Only two first-bans, only six first-picks, and “picked” as the leftover class the most, 13 times. The Odd Paladin stonewall actually broke this week. Two teams brought Even Paladin and one team brought Murloc Paladin, so there were only 45 Odd Paladins. Odd Paladin moved up in the pecking order a bit, being picked in the first phase nine times, in the second phase 13 times, and as the leftover class only nine times (second after Taunt Warrior). One Murloc Paladin and one Even Paladin also made it through picks and bans, both as the leftover class. Priest is mostly Mind Blast Priest (45). A pair of Combo Priests and a single Quest Priest complete the class. 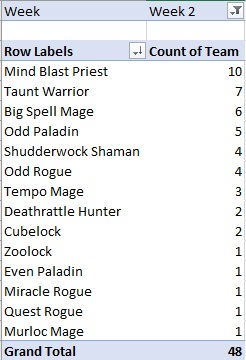 Mind Blast Priest ended up as the second-most banned archetype overall (22), usually getting picked or banned in phase two. Hunter saw a major swing towards Deathrattle Hunter (Egg Hunter) – from 27 to 40! Likewise, Recruit Hunter crashed from 13 to five. Deathrattle Hunter was also the third-most banned archetype (20) and often picked in the first phase (13), demonstrating how powerful it was considered to have become by the players. 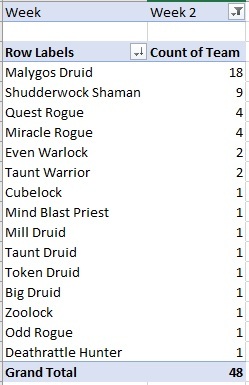 Druid moved away from Taunts (3) and Tokens (7): Malygos Druid solidified its lead (from 29 to 33) and it was also the most banned archetype in the first ban phase (18 times, 19 bans overall). To add to Druid diversity, Spiteful Druid (2) and Mill Druid (1) made their first HGG appearances. 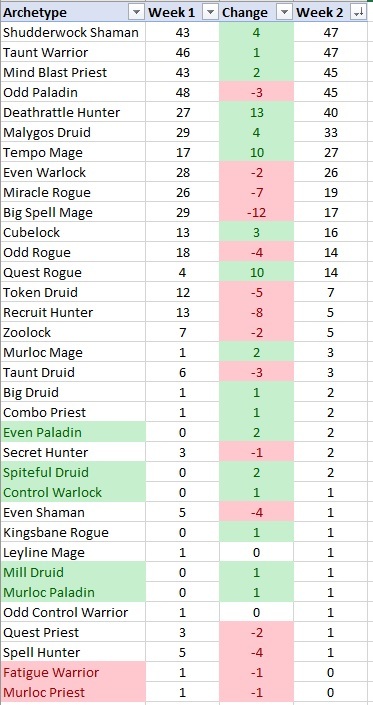 Warlock moved slightly towards Cubelock (16), but Even Warlock (26) was still the most popular archetype. Zoolock lost a couple of teams and went down from seven to five, and Control Warlock made its first HGG appearance this year – the archetype has really lost some ground lately. Rogue saw Quest Rogue skyrocket in popularity, from four to 14, a rise rivalled only by Deathrattle Hunter and Tempo Mage. It still competed with Miracle Rogue (19) and Odd Rogue (14), and a lone Kingsbane Rogue also made an appearance. Rogue was the most evenly distributed class on week two. Mage saw the biggest shift on week two. Big Spell Mage crashed from 29 to 17 while Tempo Mage rose from 17 to 27. Murloc Mage also became more popular, from one team to three teams. 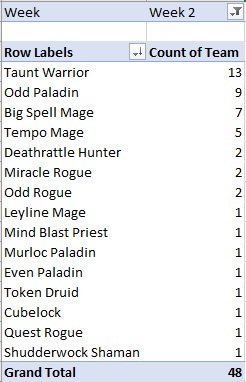 As a class, Mage was the leftover class teams were forced to play the most tied with Warrior (13 times). In the early days of this unique format, we got to see a number of major shifts: the rise of Deathrattle Hunter, Tempo Mage, and Quest Rogue and the crash in the numbers of Big Spell Mage were the defining meta changes on week two of Hearthstone Global Games. There is also some experimentation in the fringes of Mage (Murloc Mage) and Paladin (Even Paladin, Murloc Paladin) in attempts to bring the classes to more relevance as well as in Druid (Spiteful Druid, Mill Druid) in attempts to gain an advantage from the immense flexibility of the class. We may be in an old meta on the final weeks of an expansion, but there are still improvements to be made, especially in a niche format that has not been played much.